Buy-to-let stamp duty: rates and calculator - Which? When you're buying a property you don't intend to live in for most or all of the time - i.e. a buy-to-let property or holiday/second home - you'll have to pay 3% extra in stamp duty, regardless of which country of the UK you live in. The main exception to this is people who've never owned a property before and are investing in buy-to-let property as first-time buyers, who will pay standard home mover rates. Second home and buy-to-let stamp duty rates are tiered, like residential stamp duty rates and income tax. 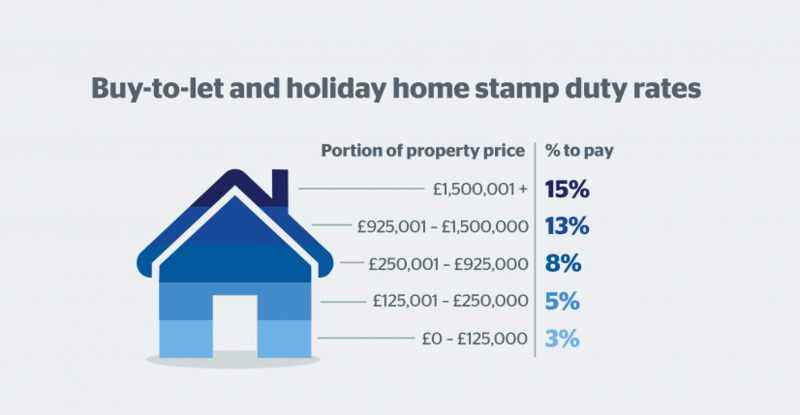 You can check out the current buy-to-let stamp duty rates for investors in England and Northern Ireland in the table below and find out how much you'll pay with our stamp duty calculator. In the Scottish Budget in December 2018, the government proposed raising this surcharge to 4% for purchases in Scotland - however, this has not yet been approved by parliament. If you're buying in Wales or Scotland, check out our guides to see the rates of Welsh stamp duty (LTT) and Scottish stamp duty (LBTT). Rates also apply to second homes and holiday homes. *If total property prices is £40,000 or less. **If total property prices is more than £40,000. Use our calculator to find out how much tax you'll pay. If you're married or in a civil partnership and either partner already owns a property, you'll have to pay the additional stamp duty regardless of how many properties you yourself own. If the purchase is not made by an individual (eg the buyer is a company rather than a person), the additional stamp duty will apply regardless of how many properties the company owns. So what properties are excluded from buy-to-let stamp duty? If the total price paid for the property is under £40,000 you won't need to pay any stamp duty at all. If you're buying a caravan, mobile home or houseboat, you'll also be exempt from stamp duty, regardless of the purchase price and whether it's going to be your main residence. If you've never owned a house before and are purchasing a buy-to-let property, you won't have to pay the buy-to-let stamp duty rates. However, you won't qualify for the first-time buyer stamp duty exemption either, as this only applies to those who intend to live in the property. Instead, first-time buyers purchasing a buy-to-let property will pay the standard home mover stamp duty rates. If you buy a new home before selling your old one, you will have to pay the higher stamp duty rate. However, you can claim this back if you sell your original home within 36 months (three years) of buying the new one. See the FAQs below for more details. It's unlikely that additional stamp duty will apply if you have inherited a small share (50% or less) in an additional property, or you hold a financial interest in one as part of a partnership or as a beneficiary of a trust. However, there are exceptions, so you should declare any financial interests such as these to your solicitor. For help working out whether you'll have to pay higher stamp duty rates, Which? members can call the Which? Money Helpline. If you're not yet a member, try Which? Money for £1 for two months for full access to the helpline. When exactly do I have to pay buy-to-let stamp duty? Stamp duty must be paid within 30 days of buying a property. In most cases, you'll transfer the money to your conveyancer, who will make the payment on the day you complete your purchase. If I'm moving house and buy a new home before selling my current one, will I have to pay the extra stamp duty charge? Initially, yes, but you can claim this back if you sell your original property within 36 months (three years). If your old home was sold before 29 October 2018, you'll have to claim your refund either within 12 months from the filing date for the stamp duty return on the new home, or three months from the sale of the old home - whichever is later. If your old home was sold after 29 October 2018, the time limit for applying for a stamp duty refund after the sale of your old home has increased to 12 months. What counts as a 'main residence' for stamp duty purposes? Your 'main residence' is the place that you and your family spend most of your time living in. To determine your main residence, HMRC will look at factors including where you work, where your children go to school and where you're registered to vote. I'm unmarried but live with my partner in a house that they solely own. I now want to buy a property in my own name. Will I have to pay the extra stamp duty charge? As long as you're not married or in a civil partnership, you can buy a property solely in your own name without paying the surcharge. My husband/wife owns the property that we live in together. If I buy a property solely in my name, will I have to pay the extra stamp duty charge? Yes. Married couples are considered as one person for stamp duty purposes. I'm buying a house in the UK, but already own a home abroad. Will I have to pay the extra stamp duty charge? It depends. If you already own a property in the UK as your main residence and are simply moving house (ie, selling your current property and buying a new one), you won't have to pay the additional charge. If, however, you own a property overseas and are buying your first UK home, you'll have to pay the surcharge as it will be counted as a second home. I own a property in the UK and want to buy a holiday home abroad. Will I have to pay the extra stamp duty charge? Stamp duty only applies to properties in the UK, so you won't have to pay it when buying a home abroad. I'm helping my child buy a property and already own my own home. Will I need to pay the additional charge? It depends. If you're gifting your child money for a deposit or acting as a guarantor on their mortgage, you won't need to pay. If your name is going on the mortgage as a joint owner, you'll technically own two properties so will need to pay the surcharge. What happens if I inherit a property? Stamp duty isn't payable on inherited properties, but if you inherit a home and then buy another one before selling it, you'll usually need to pay the stamp duty surcharge on the property you're buying. If, however, you inherit a share of 50% or less of a property and buy your next home more than 36 months later, it won't be considered an extra property. What if I want to buy a home that has a 'granny flat' or annex? As long as the annex is bought in the same transaction as the main residence, is within the grounds of the main home and is worth no more than a third of the overall value of the property, you won't have to pay the extra charge. I've split up with my partner but my name is still on the deeds. Will I need to pay the extra stamp duty when I buy a new house? Initially, yes. When you buy the new property you'll have to pay the 3% surcharge, but you can claim this back if you sell your stake in the old property within 36 months. If you'll need a mortgage for your buy-to-let property or holiday home, Which? Mortgage Advisers can help find the best deal for you. Give them a call on 0800 197 8461 or fill out the form below and they'll call you back.